When it comes to souvenirs, there’s nothing scarier than those silver tourist teaspoons with a picture on the end… Put those away quietly and take out something still very Australian and much more beautiful: an Alperstein Foldable Shopping Bag. Made from strong nylon, this lovely bag is small enough to fit in your pocket or larger bag, so you will never be without some extra carry space during an intense shopping trip. 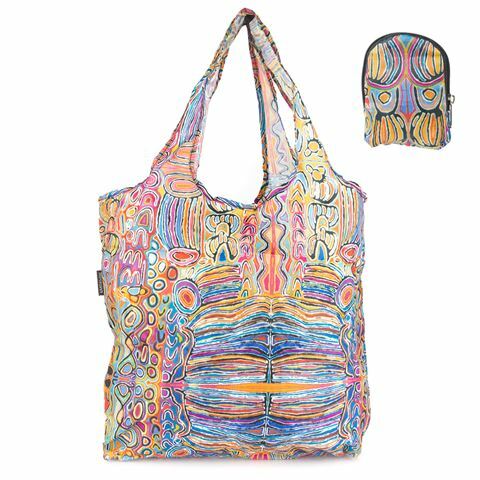 This bag is decorated with a beautiful artwork from Judy Watson, emblazoning it with colour and in turn brightening up your daily attire.